Despite their size, babies can double your laundry load. With spit-ups, accidents, and cloth diapering, babies can require multiple outfit changes over the day, leading to more laundry overall. With babies, however, any old laundry detergent won’t do. 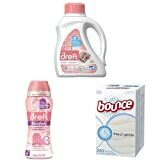 Many laundry detergents are designed with a baby’s sensitive skin and unique needs in mind. Here are our picks for the best laundry detergent for babies. Why Do I Need Baby Laundry Detergent? Babies’ sensitive skin can react to the slightest exposure to irritants, so switching to a natural, low-ingredient laundry detergent is much better for their skin. 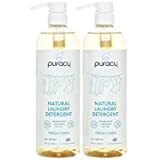 Puracy detergent was developed by doctors to clean clothing without any harsh additives or chemicals. It contains no sulfates, chlorine, animal byproducts, allergens, or brighteners. It’s plant-based and biodegradable as well, so it’s safe for sewer and septic systems. It’s also designed for use in any type of washer. Because it’s ultra-concentrated, you get 96 loads from one bottle, so it’s an affordable solution in terms of both all-natural and conventional laundry detergents. Hard water makes it difficult for detergent to lather and rinse completely, which has a significant impact on clothing, detergent usage, and energy usage. Powdered detergents perform better than liquids with hard water. 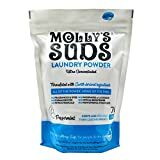 Molly’s Suds detergent is powerful but only contains 5 ingredients and no harmful chemicals or additives. It’s also vegan-friendly and contains organic peppermint essential oil. Though this has a pleasant scent, it rinses out to leave the load scent-free. This detergent is suitable for conventional or high-efficiency machines and is effective in both hot or cold water. It gets clothes clean and rinses completely, but it only takes one tablespoon of detergent per load. Synthetic laundry detergents are more likely to cause problems for a baby’s sensitive skin. Plant-based, biodegradable detergents not only minimize the exposure to potential pollutants and irritants, but they’re also better for the environment. 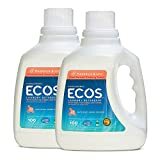 ECOS detergent is manufactured with 100% green energy and comes in a recyclable bottle. The detergent itself is plant-based and works in both conventional and high-efficiency washing machines. All its ingredients are biodegradable, renewable, and cruelty-free. It also has a built-in fabric softener, which saves you money on additional products. Cloth diapering requires additional laundry and a highly-efficient detergent. Cloth diapers that aren’t washed properly can develop a sour smell and lose absorbency, which makes them useless. The idea behind cloth diapering is reusing them, so this quickly defeats the purpose. For cloth diapers, the detergent must effectively break down the natural enzymes in waste and rinse it completely out of the diaper. In addition, it can’t have any softeners built-in, since that will clog the fibers and decrease their absorbency. 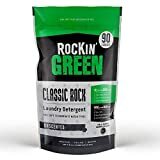 Rockin’ Green detergent is plant-based and cruelty-free, can be used in hot or cold water, is biodegradable, and contains no fillers, dyes, or brighteners that can irritate sensitive skin. It efficiently washes clothing, rinses completely clean, and won’t clog the fibers of cloth diapers. Liquid laundry detergent is preferred by many because it is high-concentrated, works on grease, and takes up less space. 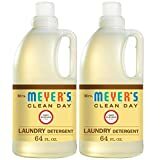 Mrs. Meyer’s detergent is plant-based, 97% natural, and comes from 25% recycled materials. The mild scent comes from essential oils, rather than chemicals, and is safer for sensitive skin. This detergent was tested by dermatologists and proven to be gentle on skin. It only takes one ounce to clean laundry, so one bottle can do approximately 64 loads. Organic laundry detergents are all-natural with plant-based ingredients and have been grown without harmful pesticides that may irritate a baby’s skin. 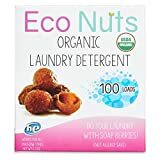 Eco Nuts laundry detergent is completely natural. It’s made from “soap nuts,” which are dried berries that are activated in hot water to release a compound that becomes detergent. They’re not really nuts, so they won’t trigger a nut allergy, but rather fruit that’s grown in the Himalayas. Because these ingredients are completely natural, there’s nothing that will irritate sensitive skin. These soap nuts are organically-grown and can be used up to ten times. They are much more affordable than conventional detergent, and are suitable for both high-efficiency and traditional washing machines. Powdered detergent is easy to clean, works well on ground-in dirt or fluids, and is generally the cheapest option. Grab Green detergent is a hypoallergenic powder detergent that is safe for septic systems and all washing machines. It can be used in hot or cold water and is highly-effective at cleaning clothes. It’s also non-toxic and contains no phosphates, chlorine, brighteners, or dyes that cause irritation. 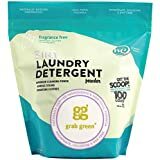 In addition, this detergent is biodegradable, ecologically-friendly, made completely from plant- and mineral-based ingredients, and is cruelty-free and is not tested on animals in any stage of manufacturing. For babies with eczema, the last thing you want is additional irritation from chemicals or additives in their detergent. Hypoallergenic detergents tend to be best for babies with eczema or other skin conditions. 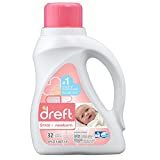 Dreft devised a plant-based detergent for babies with particularly sensitive skin. It’s hypoallergenic and contains no dyes that could potentially cause irritation. It also claims to remove 99% of food stains, works in high-efficiency or traditional washing machines, and is highly concentrated. Babies have sensitive skin that typically doesn’t respond well to scented detergents, but many people like the “fresh laundry” smell that comes from using scented detergents. To find a happy medium, hypoallergenic, scented detergents offer a pleasing scent with fewer additives to irritate a baby’s sensitive skin. 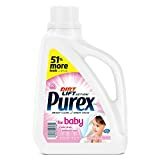 Purex laundry detergent has been tested by dermatologists to ensure its safety for a baby’s sensitive skin. It’s hypoallergenic and contains no dyes or fragrances that are likely to cause skin irritation. This detergent is suitable for both high-efficiency and traditional washing machines, and the price-per-load is highly-affordable for a hypoallergenic detergent on a budget. For babies with allergies or sensitivities, it’s important to get a detergent with limited ingredients and the lowest number of potential irritants. Even without skin sensitivities, a hypoallergenic detergent still minimizes the exposure to harmful chemicals. Dreft has been around for decades, so it comes highly recommended by pediatricians. It was developed with newborn babies in mind, knowing that they have unique skin needs. This laundry detergent is hypoallergenic and free of dyes and additives. It is also lightly-scented and has been clinically-tested for effectiveness. In addition, Dreft Stage 1 is safe for use on cloth diapers, provided they are cotton or a poly/cotton blend. A baby’s skin is sensitive and unaccustomed to the environmental irritants that adults have built a tolerance to. In addition, conventional laundry detergents get clothes clean, but often leave a residue that can cause skin irritation or allergic reactions. A baby’s skin is constantly coming into contact with fabric, such as clothes, sheets, blankets, sleep sacks, burp cloths, and cloth diapers. Because of this, any potential irritants or chemical residues are easily absorbed by a baby’s skin, so a laundry detergent with the fewest chemicals reduces this exposure. Laundry detergents are generally safe, but that doesn’t mean they are appropriate for a baby’s sensitive skin. When shopping for laundry detergent, it can also be difficult to determine what ingredients are present that may be potential irritants, since some ingredients are considered “trade secrets,” some ingredients cause problems when they build up over time, some chemicals are the product of a chemical reactions from the ingredients, and some harmful ingredients are known by different names. This can be overwhelming, but there are a few ways to minimize exposure to toxins and irritants. Purchase products that have no dyes or fragrances. Avoid products that include brighteners. Conventional or High-efficiency-High-efficiency washing machines require special detergents. If the detergent has an “He” on the packaging, that means it’s safe for use in high-efficiency washing machines. These detergents won’t lather as much and rinse clean, which prevents damage to your machine. Fragrance- and Dye-free-These ingredients are potential irritants, and their only purpose is to add a scent or the detergent or change its color. They have no impact on the effectiveness of the detergent itself. No Brighteners-Brighteners are chemicals that stay in the fabric and absorb UV from the sun to make colors appear brighter. It has no effect on the cleanliness of the clothing itself. Liquid or Powder-Laundry packs or pods pose a serious risk to young children. Liquids and powders are a matter of preference, though powders perform better, and liquids are ultra-concentrated and take up less storage space. Plant-based-Many naturally-occurring chemicals can be an irritant, but plant-based detergents lower the overall risk of exposure to synthetic chemicals and pollutants.